In the last email, we sent through a deliberate 4 step process to make the searching and analysis process easier. 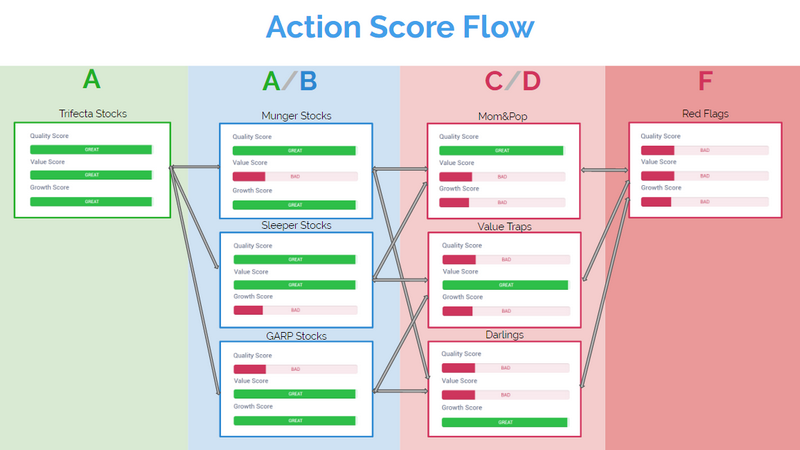 By now, you know what the Action Score is and how to best utilize it. Let's get to figuring out how to interpret it quickly. Refer to the following images because they will come in very handy. The first one is what we call a Trifecta. When a company achieves an A for all three Q,V and G, it is a great idea to look into. 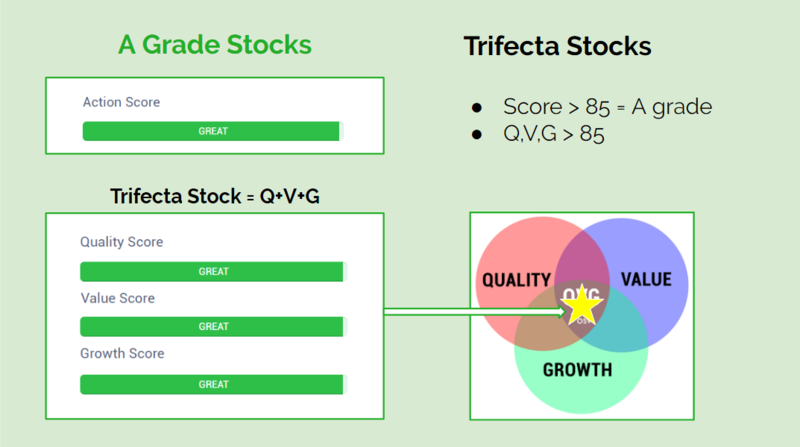 Not all A grade stocks are Trifecta's. And it doesn't mean it's an automatic buy. Having said that, these are the types of companies that have been firing on all cylinders. There is a downside to a Trifecta stock. It can only stay where it is at best, or fall to a B grade stock. A falling grade does not mean it is bad though. If the market catches on and the Trifecta rockets up in price, the value score will fall and the stock will likely become a B. But because the market is rewarding the company for its fundamentals, it is not an immediate sell. Which brings us to the B grade "Potential Stocks". B's have great potential - thus "Potential Stocks". 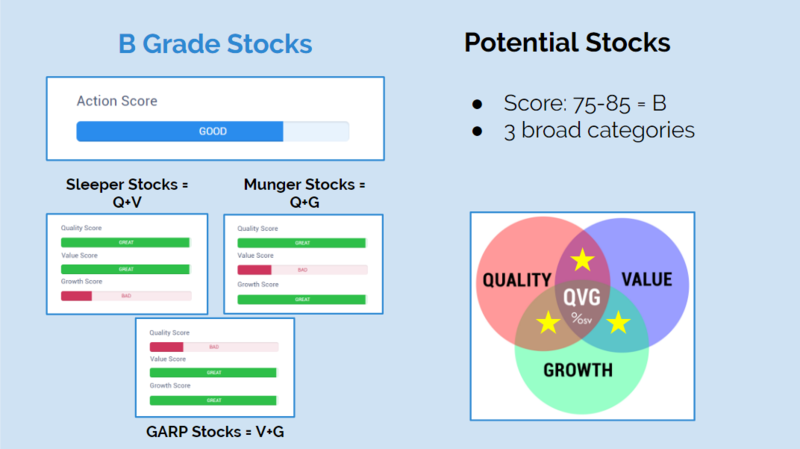 Most of the time, B grade stocks are rated highly for only two factors. This is better than being rated highly for only one category. Again, there are broad categories and there will be companies that don't fit into any of these three. But the point is to get familiar with what you are seeing. B Potential Stocks can become A grade stocks or drop to C grade. When analyzing a B grade stock, ask yourself whether the lowest of the 3 scores will rebound or fall further? E.g. 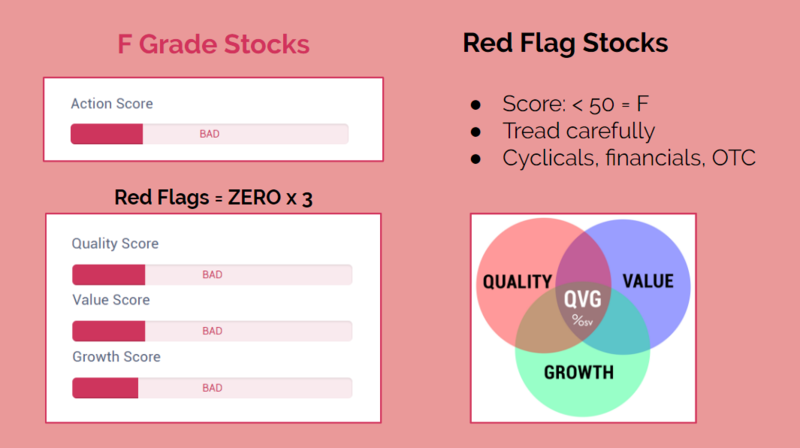 if a retail fashion company is rated a B and classified as a Sleeper Stock (Q+V), my initial assumption will be that growth will likely stay low and quality could easily drop. I'd stay away. Or say the retail company is currently a GARP stock (V+G), I'm willing to bet that growth will slow the minute something happens to the economy. B grade stocks have potential but you need to think about which direction it will go. 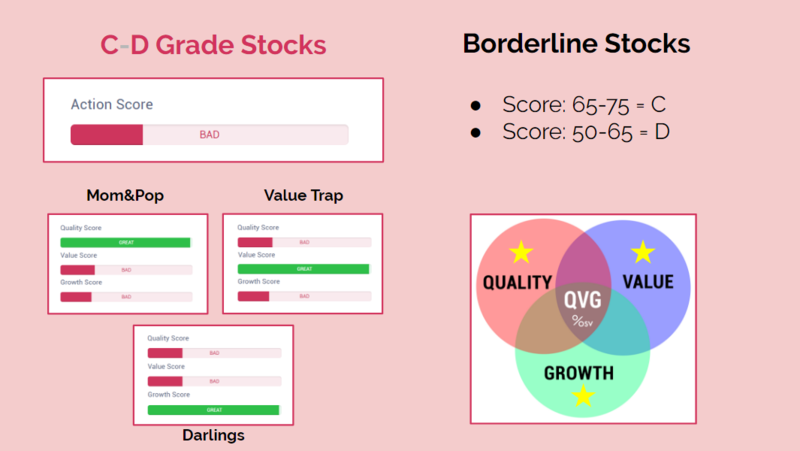 Borderline Stocks are rated C or D.
These companies are on the fringe. Also happens to be the types of stocks investors are drawn towards. If you're into value, you only look for value and forget about the rest. With this visual presentation, you are reminded that Borderline companies are complex, difficult to analyze and where lots of money is lost. When a stock only scores highly for one area and fails the other two, it requires intensive analysis to make sure you understand what you are buying. And lastly, the F grades that we call "Red Flags". These are uncharted waters and you have to be ready. Not all F stocks are bad, but the majority are. For the majority of investors, it's better to stay away. To put all this together, here's a chart that shows the movement a stock can take through the Action Score river. For the best chance of success, play with the A's and B's. Busy investors: Focus on the A's and B's. Active investors: be careful with the C's and D's. Up next, a rule of thumb on staying away from value traps. Discount rate will change the valuation, but it shouldn't be as an alternative to MOS. Discount rate is the % return you want from your investment, which means it will be different for everyone. Some people won't mind 9%. Others will want 12%. To see the explanation for growth, click on the ? button in the app. The exact formula isn't available right now.